I had the opportunity to review the new volume 3 of A Child’s Geography that was just released by Knowledge Quest! Knowledge Quest provides high quality geography and history resources and is well-known for the publication of maps and timelines. A Child’s Geography is the third book in a series of narrative history/geography books that are geared for elementary students in grades 1-6 but which can be adapted for use with older students. These books take the student on a journey through various countries, presenting the historical, geographical, and cultural information in a story-like format. These books are presented as a stand-alone history/geography curriculum. The book also comes with resources for creating your own timeline and a prayer guide to pray for each country as you study its people and cultures. 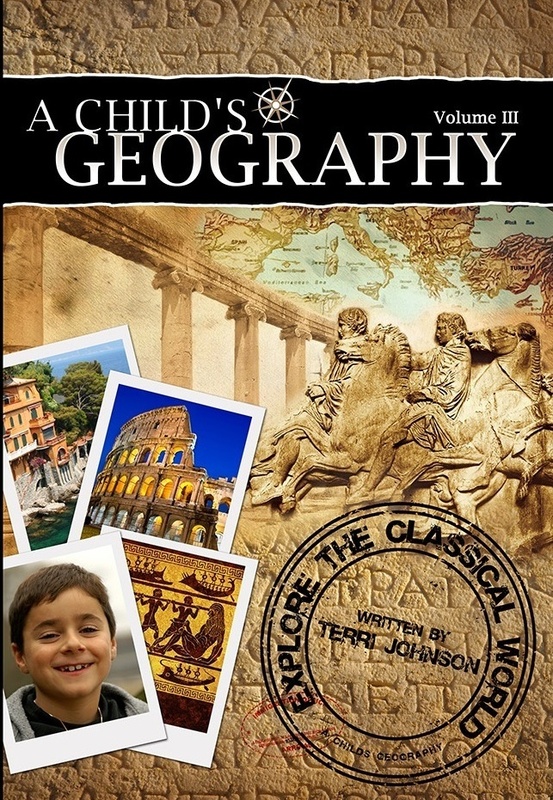 A Child’s Geography: Explore the Classical World is more than just geography. In fact, it’s more of a history text. This volume takes you on a tour through the classical world of Greece and Rome, detailing the geography, culture, and history of each geographical location. The historical information is not arranged chronologically, but rather by geographic location. For example, the first few weeks focus on Greece and historical information about various towns and cities are given as you “visit” each island or city. Later in the book, you then travel to Italy and explore the history of Rome. The book includes 224 pages with 15 chapters and covers 12 countries. The text includes beautiful pictures, multiple maps, review questions, and instructions for creating a notebook (field guide) of your journey through the ancient world. 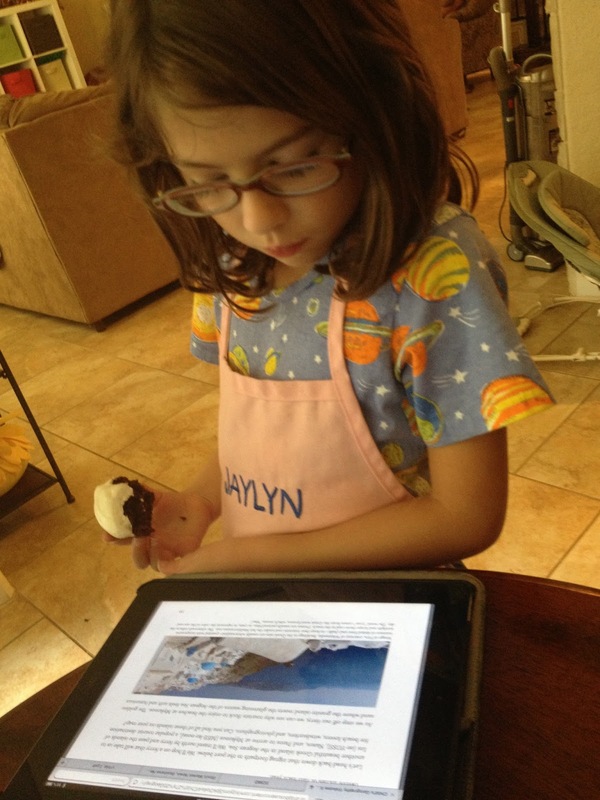 There are also recipes and timeline helps as well as hands-on activities that are included on the CD-rom that comes with the book. The book retails for $34.95 at Knowledge Quest. You can also purchase the e-book version for $24.95. I used this book as a read aloud with Curly (2nd grade). We read through a small portion of each chapter about 3 times a week. At the rate we were reading, we covered about 1 chapter every 2 to 3 weeks. We read the chapters and looked at the maps and the pictures together. We often did additional research on the various locations mentioned on the book and read additional books on the topics. Since we studied ancient history last year, many of the stories were familiar to us and Curly enjoyed re-reading some of her favorite literature that talked about the Greeks. Whenever we came to the review questions in the text, we took time to discuss them together or look back through the text to make sure Curly remembered each location. For the field guide assignments in which the student is to write his or her thoughts in a notebook, we did these questions orally and enjoyed some good discussion. Curly isn’t quite yet ready to do much writing on her own. The book also provides timeline events and the resources to create your own timeline of the events studied throughout the course. We haven’t yet done a timeline and I’m not sure we’re quite ready for that, so we simply discussed the events and kept moving forward. Basically, our time using this curriculum was just enjoyable, snuggle up and read time that we spent together. We looked at a few pictures online, watched some video clips, read a few additional selections from our home library, looked at maps, and chatted about what we thought it would be like to live in one of these countries, both then and now. We also talked about the cultural differences and spent time praying for the people of each area. I found it hard to find good stopping points at the end of each day’s reading. We could only read short amounts of the book at each sitting because it was a lot of information to take in and we wanted to progress slowly and enjoy the story. The whole point of these texts is to present history and geography in a living book so there are no subsections for each chapter. I would have liked to have something that indicated that we were moving to a new city or town or to a new area of that city, so that we could have a natural stopping point for each day. The book is divided by geographic section and the history is introduced by location and not in chronological order. While this makes perfect sense for the way the book is written, it is a little tricky to help a younger student understand the time frames of the various events when you don’t cover them in chronological order. Well, the pictures are beautiful, so for the visual learners in my house (me and Curly), this was the perfect resource! The narrative format is interesting to read as facts about the people, culture, history, and geography are all woven together to present a well-rounded look at each country. I was impressed with the amount of history presented in each chapter. This book is definitely written from a Christian perspective and I liked the way the myths and religions of other cultures are presented. The author clearly explains their beliefs but points the reader back to Scripture to uncover truth about Christianity and compare Christianity to the other religions. Christianity is always presented as truth. The book includes a prayer guide to help you pray for the other countries as you study them. This was a wonderful resource after reading about the cultures and beliefs of the residents in the other countries. Curly was excited to know how to specifically pray for each country as she compared how their beliefs compared to ours. After reading several chapters of this book, we felt like we had taken a relaxing journey to the beautiful countries of the world that surround the Mediterranean Sea. We could hear the waves crash, picture the bustle of the marketplace, and feel the wind on our faces as we traveled to mountain tops or drove through the country side. The text is so vivid that you feel like you have been there and experienced each country. I found that this enabled Curly to remember the facts about the history and geography of each country very well because she could picture herself within the story. It was such a painless way to learn history and geography! I struggled a little bit with not having the history presented in a chronological way but was pleased with the way information about cultures and peoples of the countries was included as well as facts about geography. It is very well-rounded. I didn’t know quite to expect when we began our journey through the ancient world. I assumed the book would mostly contain geographical facts with some information about the culture of each country. I never realized the amount of history that would be included! 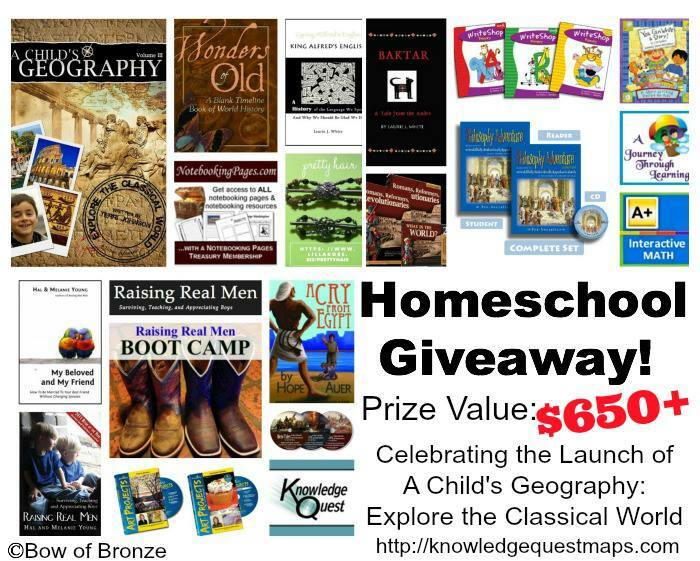 Just for fun I’m giving away 1 digital copy of A Child’s Geography: Explore the Classical World right here! Enter below! Be sure to enter the mega giveaway below! Disclaimer: I received a free copy of this product in exchange for an honest review. I was not asked to write a positive review nor was I compensated in any other way. All opinions expressed are my own. I am disclosing this in accordance with FTC regulations. I would love to see the ruins in Athens. I think that would be very interesting. And I would want to see the Colosseum in Rome! Some of my friends have been to Athens. After hearing about their experiences, I would love to visit the area myself. I would love to see Mount Olympus with my son because he is enthralled with the myths. I would love to see the Coloseeum in Rome! would love to see the small towns that are still steeped in tradition. I would love visit Corinth in Greece or anywhere in Rome, especially Vatican City. I think Greece is absolutely beautiiful so would like to learn more. hands down Rome. come on the Roman people all their history is our history. I would love to visit Greece, instead of Rome. Greece is older. Thanks for the giveaway. I could use this with my son for year 4 next year. I would love to see Greece! I want to see the coliseum in Rome.